The Stop the Bleed campaign was launched in the USA in 2013 by the Hartford Consensus, a collaborative group of federal law enforcement, trauma surgeons and emergency responders, to improve survival for the victims of gunshots, and mass-casualty events such as the Sandy Hook Elementary shooting or the Boston Marathon bombings. The consensus concluded that the leading cause of preventable death in these incidents was uncontrolled bleeding. MED Response Pty Ltd (the company) adapted the US program and contextualised it to the Australian environment with full consent. Approval included the need to change certain aspects of the program so that it could make a seamless transition from one country to another. The program is putting the knowledge gained by professionals and the military into the hands of those who can save lives in the first 3 to 5 minutes. We have been delivering STOP THE BLEED® since mid-2015 and have now trained hundreds of first responders (Police, rescue, Medics, security), industrial workplace employees and motorcyclists in this life-saving education. The objectives of the ANZCOR Guidelines are to foster a national uniformity and simplicity in resuscitation techniques and terminology. These guidelines are produced after consideration of all available scientific and published material and are only issued after acceptance by all member organisations. Apply direct or indirect pressure. If bleeding not controlled by above measures, use a haemostatic dressing and be trained in its use. If bleeding not controlled by above measures, use a tourniquet above the bleeding point if available and trained in its use. The need to control the bleeding is paramount. The risks associated with the use of haemostatic dressings or a tourniquet are less than the risk of uncontrolled severe bleeding, though these are temporising measures and transfer to hospital remains of high importance. The “Stop the Bleed” campaign was initiated by a federal interagency workgroup convened by the National Security Council Staff, The White House on 6th October 2015. Its purpose is to build national resilience by better preparing the public to save lives. After the 2012 Sandy Hook Elementary School shootings, the American College of Surgeons (ACS) assembled the Joint Committee to Create a National Policy to Enhance Survivability from Mass Casualty Shooting Events, which met in Hartford, Conn. The committee’s deliberations are known as the Hartford Consensus™. These meetings were driven by the idea that no one should die from uncontrolled bleeding. In 2015, the White House initiated the Stop the Bleed campaign, in which the ACS and Hartford Consensus played an integral leadership role. 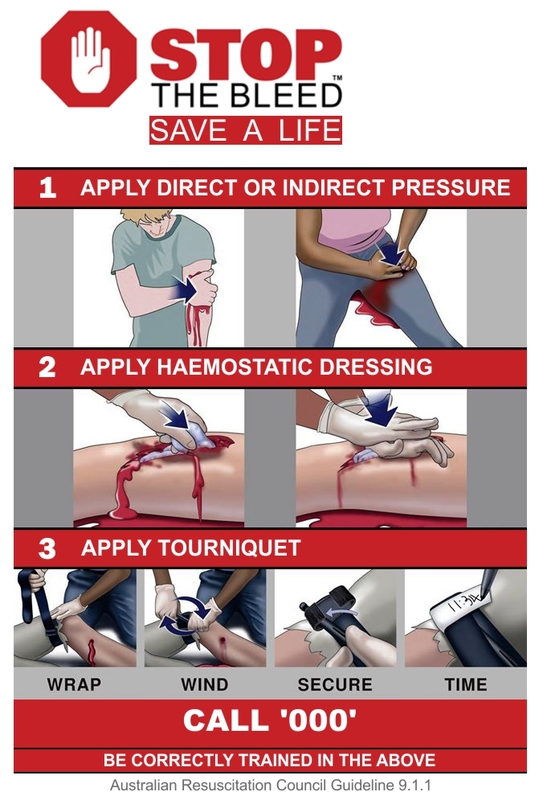 Developed by the National Association of Emergency Medical Technicians (NAEMT), Prehospital Trauma Life Support (PHTLS) Committee and the American College of Surgeons (ACS) Committee on Trauma (COT), Bleeding Control for the injured course was tailored and introduced to a public audience as part of the Stop the Bleed campaign. The ACS Committee on Trauma were responsible for approving and registering instructors. The Committee for Tactical Emergency Casualty Care (C-TECC) was convened to speed the transition of military medical lessons learned from the battlefield to civilian response in order to reduce preventable causes of death in both our first responders and civilian population. Considerable expertise and effort has gone into the development of a civilian operational medical standard in parallel to the successful guidelines of Tactical Combat Casualty Care. Tactical Emergency Casualty Care (TECC) is the civilian evolution and application of the military Tactical Combat Casualty Care (TCCC) guidelines. The key reason is that the TCCC as a system has limited application in the civilian setting. MED Response is an authorised licensed provider. MED Response Pty Ltd / Janine Nicholas is a registered and approved instructor for the American College of Surgeons, Committee on Trauma Bleeding Control Basic Course. Previously known as the National Association of Emergency Medical Technicians (NAEMT) Bleeding Control (B-Con) course. MED Response Pty Ltd is approved by the Committee for Tactical Emergency Casualty Care (C-TECC) as an authorised educational partner in accordance with the principles of guidelines instruction set by the Committee. Is your workplace ready to STOP THE BLEED® and Save a Life? This entry was posted in Stop the Bleed and tagged Haemostatic Dressings, Med Response, Stop the Bleed, Tourniquet, TraumaSim. When It Bleeds Through Just Add on More Dressings!